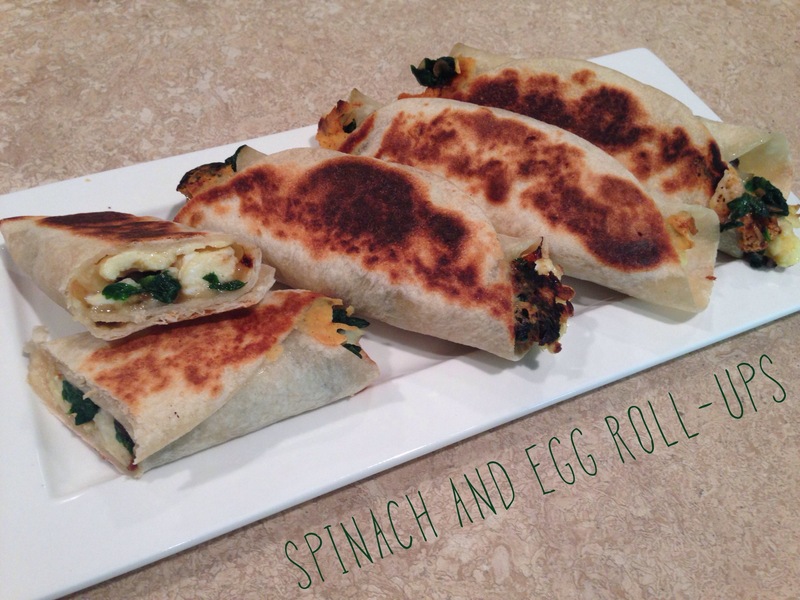 spinach and egg roll-ups | Is there any wine left? Whitney wasn’t feeling well earlier this week and he wanted comfort food for lunch one day. Generally that would be a reasonable request… except that Whitney considers Whataburger comfort food! I was pretty sure he would have another kind of sickness in addition to his respiratory infection if he had a #4 plain and dry, Whata-sized. So instead, he got the next best thing — spinach and egg roll-ups. These are loaded with iron and vitamins from the spinach and protein from the eggs. A couple of these and he was feeling like a new person! Sauté the onions with a sliver of butter in a skillet over medium heat for 3-4 minutes, until they are slightly browned. Add 1/4 tsp. salt, another sliver of butter, and the spinach to the pan and cook until it is wilted. Remove the spinach and onions from the pan and place on a cutting board. Roughly chop the spinach-onion mixture and then sprinkle with the cumin. Set aside. Whisk the eggs and milk and remaining 1/4 tsp. salt. Wipe out the skillet you used for the spinach, and soft scramble the eggs over low heat. Remove to a plate. Wipe out the pan again. Heat the pan over medium heat. Down the middle of each flour tortilla, add eggs, spinach, and cheese. Roll up the tortillas tightly and place each in the pan, seam side down. Let cook for 2 minutes, until browned and sealed. Flip and cook on the other side for another minute or two. Serve alone or with salsa. So glad to get one of your recipes again! You are such a good cook like your mother and a delightful read. This sounds delicious. Hope to see you soon. Can’t wait to try these, Katie! They look so yummy.